Appointed by main civil contractor John Mowlem Construction Ltd, Qualter Hall's scope of work included the design, supply, installation and commissioning of a new double leaf pedestrian swing bridge over the River Liffey near Custom House Quay in Dublin. Two bridge leafs each measuring 44m nose to tail and 4.5m wide, provide a river crossing of 88m bank to bank and these swing open to allow boats to pass along the river. Each leaf weighing 180 tonnes, rotates on a centre pivot driven through 90 degrees by twin hydraulic cylinders, with interlocked hydraulic nose and tail bolts. Hydraulic power units and electrical controls are located below the deck adjacent to the centre pivots. 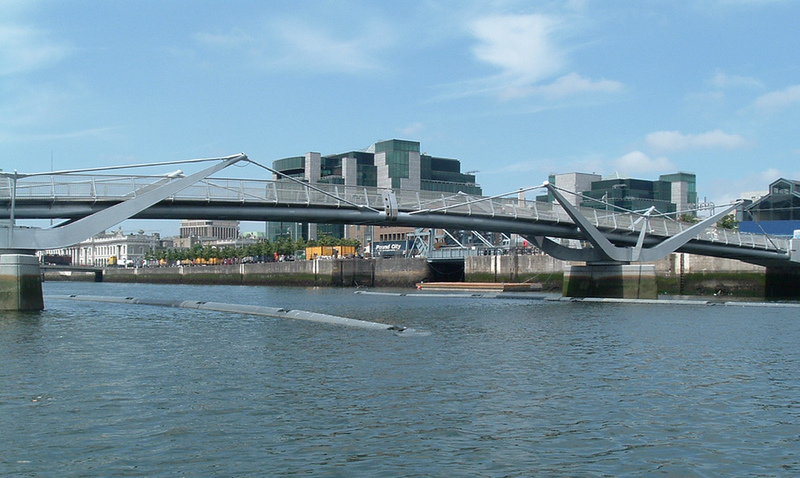 Each bridge leaf is supported centrally on a fabricated cradle having four arms, which are located at eithe side of the walkway area. 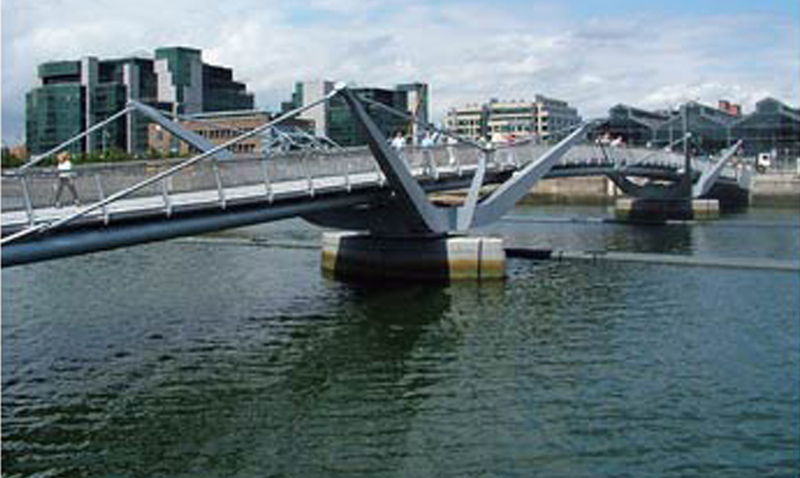 The bridge decks are supported at both extremities with a cable rod system, which is connected to the tips of the cradle arms. The deck is constructed from aluminium hollow section profiles and both sides are fitted with stainless stell protective handrail and balustrade infill panels. 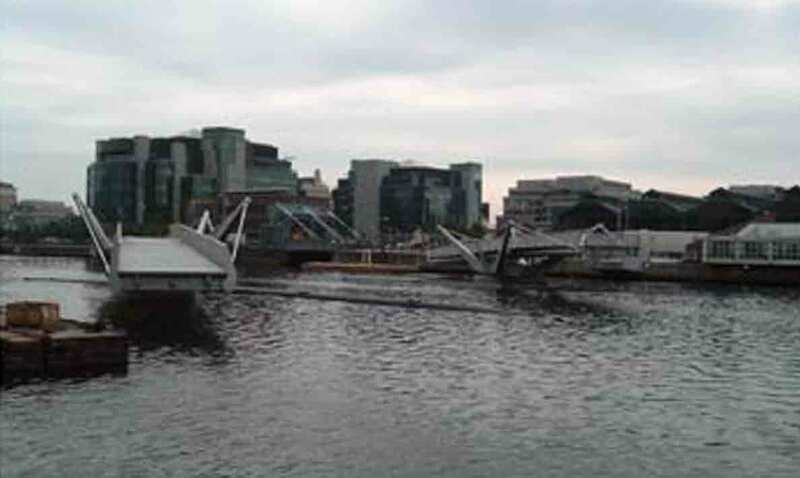 Each bridge leaf pivots horizontally on a slew bearing that is secured to the central fabrication, which in turn is anchored to the top of the concrete support plinth in the river. 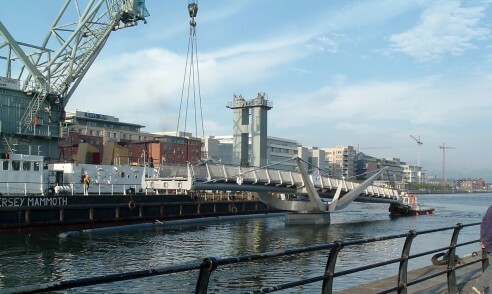 The bridge is operated locally by radio pendant, with pedestrian gates being closed prior to operation. Qualter Hall were responsible for complete design of the mechanical, electrical and hydraulic operating and control systems for the bridgge. Also for the detail and incorporation of the client's initial structural design into fabrication drawings. The bridge was part of a large scale urban renewal scheme under the Dublin Docklands Development Authority, to link both the north and the south quays and rejuvenate both.